Melbourne promises great events, fantastic food and wines, an inspiring art scene and a plethora of activities and attractions to entertain the whole family. Be enchanted by this cosmopolitan city as you soak up the vibrant Australian atmosphere. If you're a fan of the TV Soap 'Neighbours', don't forget to visit Ramsay Street! 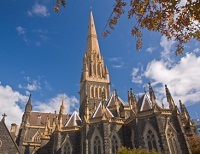 Melbourne is the capital of the State of Victoria and Australia’s second largest city. European in style with elegant Victorian architecture, a network of trams, great open parklands and a vibrant café scene, Melbourne is renowned for its cultural scene as well as being host to a glittering array of world-famous Sporting Events. These include the F1 Australian Grand Prix, Australian Open Tennis championship, Melbourne Cup and of course The Ashes at the Melbourne Cricket Club (MCC). There are no direct flights to Melbourne, Australia from the UK however there is a good choice of airlines which fly via The Middle East, Far East or USA with a change of aircraft or transit on route. Many travellers take advantage of a stopover for a day or two on the way. Famous for its style, Melbourne boasts a myriad of arcades and lanes thriving with galleries, boutique shops and exclusive designer stores as well as the popular department stores on Bourke Street and Collins Street. Head to the Southbank to experience the best of Melbourne’s cutting-edge culture in its Art Galleries, Museums and Theatres or visit the Australian Centre for the Moving Image in Federation Square. Melbourne is a melting pot of ethnic diversity which is reflected in its exciting food and wine scene – with Chinese, Italian and Greek influences to name but a few, the cuisine is eclectic with a huge variety to suit all tastes and budgets. The nearby Yarra Valley, home to over 70 wineries, provides many of the famous wines in Melbourne’s restaurants and bars. Explore the numerous parks on foot including the Aboriginal Heritage Walk through the Royal Botanical Gardens and Fitzroy Gardens or discover the city by tram. Head to the beach resort of cosmopolitan St Kilda, one of Melbourne’s most fashionable suburbs, or travel further afield to the many attractions Victoria has to offer including the Great Ocean Road, Mornington Peninsula, the Macedon Ranges and Phillip Island. Our flight search box above is one of the best ways to find the cheapest flights to Melbourne, Australia around. Certain times of the year such as Christmas and New Year are particularly busy for travellers to Australia, so to find cheap flights to Melbourne, Australia, we would recommend you travel outside of the peak seasons if you can and book well in advance. Look out for airline special offers and 'seat sales' for low cost flight deals, Directflights.com can also help to find you availability and the most competitive fares on lastminute flights. As with other Australian cities, Melbourne also enjoys hot summer months between December-February with temperatures reaching up to 34˚C but it has been known to reach 40˚C. Although mild weather occurs during Autumn and Spring, the city can get warm days of about 20˚C. During the winter months (June to August) temperatures fall to an average of 8˚C.